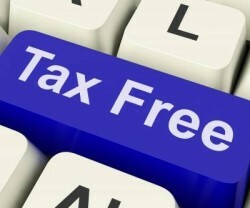 Everyone wants to have a break from paying taxes, so it pays to know the legal ways we can avoid paying taxes. One of them is to take advantage of the exemption from capital gains tax (CGT) on the sale of a principal residence. Learn how you can avail of a capital gains tax exemption when you sell your home below. 1 What is Capital Gains Tax (CGT) on the sale of real estate? 2 What is a Principal Residence? 6 Is this the Philippine version of the US 1031 exchange? 7 Is it worth the hassle? What is Capital Gains Tax (CGT) on the sale of real estate? Basically, the seller of a real property considered as a capital asset will be subject to CGT. However, if the capital asset sold is the seller’s own principal residence, the sale may be exempt from CGT. CGT is computed at 6% of the highest among the BIR zonal value, tax declaration value, or selling price, so the tax savings may be significant. Just to give you an idea, for the sale of a P1 million property (assuming this is the fair value), the CGT is P60,000. For a P10 million property, the CGT is P600,000. I think the savings may really be significant so it pays to learn about this tax saving opportunity. In other words, the principal residence is the seller’s family home. There may be times when the owner wants to sell his old home and buy a new one in a new place, or maybe a bigger one to accommodate a growing family. There may also be times when owners of a big house experience an “empty nest” feeling as their children have their own lives, so they want to live in a smaller house or maybe even a condominium unit near a hospital or places of interest. Please note that as per RR 14-00. the residential address shown in the latest income tax return filed by the vendor/transferor immediately preceding the date of sale of the said real property shall be treated as a conclusive presumption about his true residential address. Thus, if you plan to avail of the CGT exemption on the sale of real property, make sure that your address in your latest tax return is the address of the property to be sold. If there is no full utilization of the proceeds of sale or disposition, the portion of the gain presumed to have been realized from the sale or disposition will be subject to Capital Gains Tax. In case of sale/transfer of principal residence, the Buyer/Transferee shall withhold from the seller and shall deduct from the agreed selling price/consideration the 6% capital gains tax which shall be deposited in cash or manager’s check in interest-bearing account with an Authorized Agent Bank (AAB) under an Escrow Agreement between the concerned Revenue District Officer, the Seller and the Transferee, and the AAB to the effect that the amount so deposited, including its interest yield, shall only be released to such Transferor upon certification by the said RDO that the proceeds of the sale/disposition thereof has, in fact, been utilized in the acquisition or construction of the Seller/Transferor’s new principal residence within eighteen (18) calendar months from date of the said sale or disposition. The date of sale or disposition of a property refers to the date of notarization of the document evidencing the transfer of said property. In general, the term “Escrow” means a scroll, writing or deed, delivered by the grantor, promisor or obligor into the hands of a third person, to be held by the latter until the happening of a contingency or performance of a condition, and then by him delivered to the grantee, promise or obligee. The requirements are quite straightforward except for that part about the 6% CGT being set aside and put in “escrow” with an Authorized Agent Bank (AAB). Escrow is not a very common scheme done in the Philippines but admittedly, it is a good way to ensure that the tax exemption will only be availed by those who complied with all conditions set. Perhaps in the past, when escrow was not yet required, there may have been some people who availed of the tax exemption but did not really fufill the conditions set. It may have been hard for the BIR to run after the unpaid CGT since no amount was set aside to answer for it. With the current set-up, should the conditions not be met, it would be easy for the BIR to assess the deficiency CGT and collect the original CGT due because they need only to give instructions to the bank to forfeit the amount (or a portion of the amount) in escrow. (2) Multiply the % of non-utilization by the GSP or FMV, whichever is higher. (3) Multiply the product in item (2) above by the rate of six percent (6%). If the seller fails to utilize the proceeds of sale or disposition in full or in part within the 18-month reglementary period, his right of exemption from the capital gains tax did not arise to the extent of the unutilized amount, in which event, the tax due thereon shall immediately become due and demandable on the 31st day after the date of the sale, exchange or disposition of principal residence. As such, he shall file his capital gains tax return covering the sale, exchange or disposition of his principal residence and pay the deficiency capital gains tax inclusive of the twenty five percent (25%) surcharge for late payment of the tax plus twenty percent (20%) delinquency interest per annum incident to such late payment computed on the basis of the basic tax assessed. The interest shall be imposed from the thirty-first (31st) day after the date of the sale of principal residence until the date of payment, provided, that the date of sale shall mean the date of notarization of the document of sale, exchange, or disposition of principal residence. (1) In case the proceeds from the sale, exchange or disposition of his principal residence has been fully utilized to acquire his new principal residence. — Assume that Mr. Arnold Buendia acquired his principal residence in 1986 at a cost of P1,000,000.00. He sold the said property on January 1, 1998, with a fair market value of P5,000,000.00, for a consideration of P4,000,000.00. Within the 18-month reglementary period, he purchased his new principal residence at a cost of P7,000,000.00. (a) To compute for the capital gains tax due. — In this case, Mr. Buendia shall be exempt from the capital gains tax otherwise due from him since the entire proceeds of the sale has been fully utilized to acquire his new principal residence. (2) In case the fair market value of the old principal residence is equal to the cost to acquire the new principal residence. — Using the above illustration, if for example, instead of P7,000,000.00, Mr. Buendia was able to acquire his new principal residence at a cost of P4,000,000.00, which is equal to the gross selling price of his old principal residence. (a) To compute for the capital gains tax due. — In this case, Mr. Buendia is still exempt from the payment of the capital gains tax otherwise due from him because there has been full utilization of the proceeds from the sale of his old principal residence within the 18-month reglementary period. (3) In case the proceeds from the sale of his old principal residence has not been fully utilized to acquire his new principal residence. 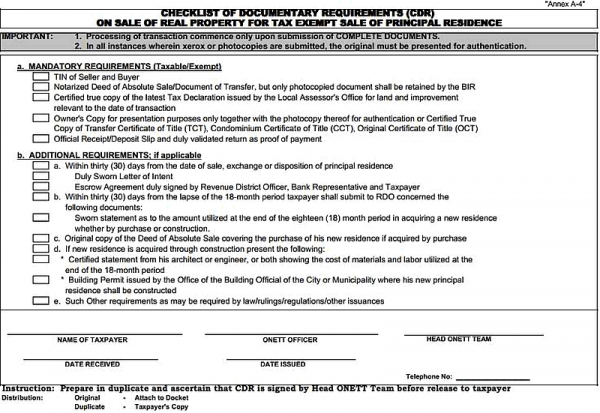 — If Mr. Buendia acquired his new principal residence within the 18-month reglementary period but did not, however, utilize the entire proceeds of the sale in acquiring his new principal residence because he only used P3,000,000 thereof in acquiring his new principal residence, that portion of the gross selling price not utilized in the acquisition or construction of his new principal residence shall be subject to capital gains tax. SECTION 5. Disposition of the Principal Residence in Exchange for Property Other than Cash. — (1) If the individual taxpayer’s principal residence is disposed in exchange for a condominium unit, the disposition of the taxpayer’s principal residence shall not be subjected to the capital gains tax herein prescribed, provided that the said condominium unit received in the exchange shall be used by the taxpayer-transferor as his new principal residence. In this particular case, the exempt provision of Sec. 24(D)(2) of the 1997 Tax Code shall only apply to the transferor of the principal residence and not to the transferee who shall be subject to the capital gains tax in case his/its condominium unit is treated as capital asset or to the income tax which shall be withheld in accordance with Sec. 2.57.2(J) of Revenue Regulations No. 2-98, as amended, in case the condominium unit is treated as an ordinary asset. However, if the condominium unit is similarly treated by an individual owner as his principal residence, then the same shall also be covered by the exempt provision under Sec. 24(D)(2) of the same Code. Example: Mr. Buendia assigned and conveyed his principal residence to ABC Realty Corporation in exchange for a condominium unit which Mr. Buendia will use as his new principal residence. Thus, Mr. Buendia is exempt the from imposition of capital gains tax on the exchange of his new principal residence while ABC Realty Corporation, on the other hand, shall be subject to income tax, on its exchange of the condominium unit. (2) If the said taxpayer’s principal residence is disposed of in exchange for a parcel of land and such land received in the exchange shall be used for the construction of his new principal residence, no income tax or capital gains tax shall be imposed upon the owner of the principal residence. However, the owner of the land shall be subject to capital gains tax or to income tax, as the case may be. (3) If in the acquisition of his new principal residence, the taxpayer exchanged his old principal residence plus cash or other property, the unutilized portion subject to capital gains tax shall be determined by the difference between the total consideration made on the conveyance of old principal residence transferred (FMV of old principal residence + cash or FMV of other property) and the total consideration received (FMV of new principal residence) for such exchange. Example: Mr. Buendia assigned and conveyed his principal residence with fair market value of P4,000,000 and in addition paid P2,000,000 to acquire as new principal residence the principal residence of Mr. Yabut. Mr. Yabut, on the other hand, conveyed his principal residence to Mr. Buendia with fair market value of P5,000,000, with the intention of making the property received from Mr. Buendia as his new principal residence. The historical cost of the old principal residence of Mr. Buendia is P1,000,000 while the historical cost of the old principal residence of Mr. Yabut is P500,000. (a) Computation of capital gains tax due on the exchange of property by Mr. Buendia — No capital gains tax is due from Mr. Buendia for the reason that there has been full utilization of the value of his old principal residence exchanged where in addition to fair market value of his old principal residence of P4,000,000, he still paid cash of P2,000,000 to acquire as his new principal residence the old principal residence of Mr. Yabut valued at P5,000,000. In order to avail of the tax exemption from capital gains tax with respect to such exchanges, the aforesaid taxpayer is nevertheless required to acquire his new principal residence within the eighteen (18) month reglementary period, otherwise, he shall be liable to pay the capital gains tax on the disposition of his principal residence. In all cases of exchange of principal residence for another real property, the liability of documentary stamp tax provided under Sec. 196 of the 1997 Code shall accrue to both parties involved in the exchange. For other nitty-gritty details, as well as a sample of the Sworn Declaration of Intent to avail of the CGT exemption on the sale of a principal residence, please refer to BIR Revenue Regulations (RR) No. 13-99. For a sample Escrow Agreement and Release from Escrow Agreement, and Forfeiture of the Bank Deposit in Escrow, please refer to BIR Revenue Regulations (RR) No. 14-00. Is this the Philippine version of the US 1031 exchange? No. While they may look similar at first glance, they are quite different. In the US, a 1031 exchange can be availed where the capital gains taxes are deferred and are not due during the time of the exchange. However, this is only allowed for properties that are “…held for productive use in a trade or business or for investment.” . In other words, you cannot do a 1031 exchange for properties for personal use, like a principal residence as discussed here. To learn more about 1031 exchanges in the US, you can read this wikipedia article and also this article on the 10 Things To Know About 1031 Exchanges from Forbes.com. You may have noticed that the availment of the CGT exemption has a lot of requirements, and the money for the CGT is actually set aside first and only returned after the requirements have been complied with. I will not be surprised if there are only very few who avail of this exemption, since either only a few know of it or they may think that the hassle may not be worth the tax savings. In any case, money is money, saving Php 60,000 in CGT for every Php1,000,000 is a big deal, and any opportunity to save that much in taxes is always welcome. So for me, it’s well worth it! How about you? Let me know by leaving a comment below. Hi Cherry, i am reselling my condo unit while it is still loaned in pag ibig. My buyer will only pay me 1/5 of the total contract price and will assume the rest of the balance thru subrogation. Should i be charged with CGT for the total selling price? If yes, how can i file for exemption from CGT? Thanks Mark and goodluck! I look forward to seeing your name in the list of topnotchers! Hi Jay, very nice article. Is FMV the same as the zonal value + improvement? What happens in the following situation? Mr. Yu sells his residence for 10M, and avails of CGT exemption. On the 18th month after selling the property, he acquires a bare lot whose amount is 8M, with the intent of constructing a house which is to projected to cost 5M. Does Mr. Yu still have to pay CGT since the value of the property and the house to be constructed is worth 13M? Hi! I have a question my brother bought a lot months ago then he ask for cdr and computations regarding the tax payments, the case is when he got his computations he was not able to pay the said tax until it becomes due. Then, the next next months he was subject again to work abroad which is means he was not really able to pay tax, then he tell me to process it to BIR since he already have money and, my question does it needs an authorization letter or not? well he obviously forgot to left a letter. Please to hear your advise. Cherry, It’s been 1 year since we applied for CGT exemption and until now it is still pending approval by BIR. Worst, the CAR cannot be issued to be able to transfer the title which is a requirement for the bank loan to be released. What do you suggest would be the next step since it’s been worthless following up with the Legal division of BIR. It doesnt really matter if it is approved or not. I just want them to release their opinion. M shujen.my dad is 79yrs old.we transacted a deed of sale for our family home with me as rhe buyer just so the property is transferred before he passes on.for purposes of paying minimal lawyer fee,slling price was 50k when actually there was no sale! You said there is exemption frm cgt if principal residence is sold.added to this,he is a senior citizen.ho to go qbout filing? mam cherry i want to avail the cgt exemption. ibsold my property for 900k. i will buy a prperty worth 2.8m. the requirements ask for a sworn statement of full utilization. but at the deed of sale of the property i will buy it is stated there that 2.4m will be bank financing. 400k will b the down paymnt. am i still qualified to avail the tax exemption? Background: I bought a property with the agreement with the seller that i will be shouldering the capital gain. Can the capital gain be computed based on the zonal value when the time that i bought the property, supported by all the documents? Appreciate to know. if in case the selling is net for the seller price …the buyer should pay all the taxes should they exempt the tax? What if a property owner purchases a new property to be his new principal residence before his previous principal residence is sold, will he still be able to avail of the CGT exemption from the sale of his previous principal residence? What if the value of the property that the seller intends to transfer to is lower than the selling price of the original property, Will the BIR charge for the difference? Hi Edwin, until my wife Cherry finds time to answer, let me give you my opinion. Just in case there is an unutilized amount (if the new property has a smaller selling price), that will be subject to CGT.